An intriguing woodworking project for the beginning or intermediate woodworker. Gene Shaw moved to Lancaster, Pennsylvania, in 1972 after receiving a Fine Arts degree from the Pennsylvania Academy of Fine Arts and a Bachelor of Arts degree from the Philadelphia College of Art. While at PAFA, he received numerous awards, prizes, and grants. In Lancaster, Gene combined his fine art/design training and his love of woodworking, a skill he learned from his father, to establish The Wooden Plane, a custom cabinetry and home restoration business. He and his wife built a new home in town, featured in Fine Homebuilding magazine in 2006. The Historic Preservation Trust of Lancaster County twice awarded him the C. Emlen Urban Award, for preservation leadership and new-home construction in an historic district. Since 2005 he has traveled to Brooklin, Maine, to attend boatbuilding courses at WoodenBoat School. 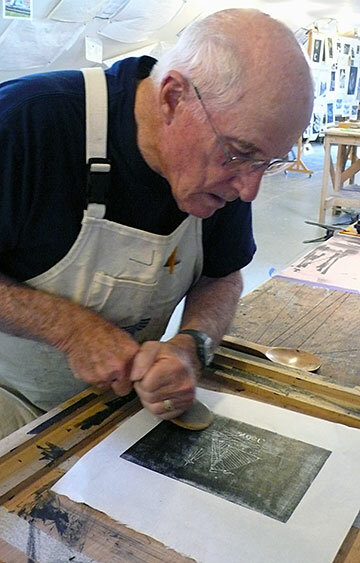 While here, Gene has made numerous sketches that are the basis for the woodcuts he creates upon his return to Lancaster. In June 2016, he won first prize in the works-on-paper division at the annual “Art of the State” exhibit in Harrisburg, PA. In July of 2016, Gene was chosen to participate in a month-long artist-in-residence program at the Heliker-LoHotan Foundation on Great Cranberry Island, ME. He had a one-man show at Lancaster Galleries in 2017 featuring woodblock prints and tables made from repurposed materials. Gene is represented by Lancaster Gallery in Lancaster, PA and Turtle Gallery in Deer Isle, ME. Woodcut printmaking is a relief-printing art technique in which an image is carved into the surface of a block of wood, with the printing parts remaining level with the surface while the non-printing parts are removed, typically with gouges, knives, and chisels. It was created in about 1400 in Europe and, throughout time, has gone through various levels of technical and artistic development among woodworkers around the world. 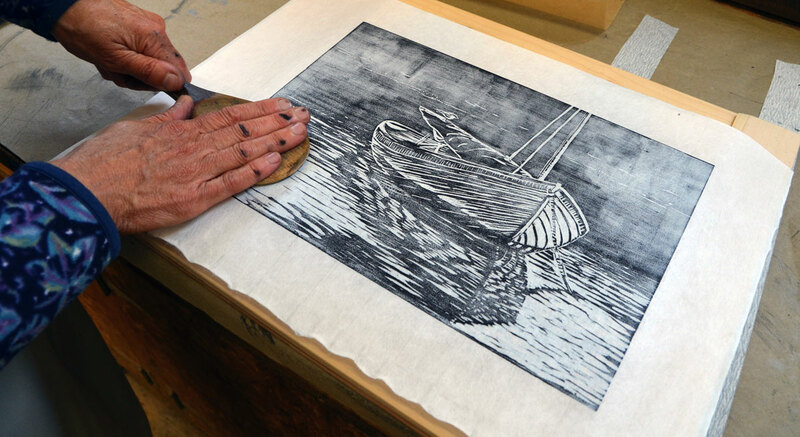 Gene Shaw, artist and master woodworker, has designed this captivating course for individuals interested in learning how to create black-and-white woodcut prints. On Monday morning, Gene will introduce students to the proper use of carving tools, methods to sharpen them, and how to make a straight knife from a simple hacksaw blade. During the week, work will be done on both soft and hard woods, plywood, and linoleum blocks. There will also be an introduction to various papers, inks, and brayers. Printing will be by hand using a traditional Japanese barren (of several types) or a bamboo paddle, the instructor’s favorite. A trip to a nearby gallery that exhibits woodcuts and wood engravings by a number of local artists will be planned early in the week to expose students to a wide variety of styles. A visit to a handmade paper gallery will include a demonstration and a chance for each student to make a couple sheets of paper. After the paper dries, students will use it to print their own woodcuts. Anyone interested in woodcarving and woodworking will be fascinated by this week with Gene, a very talented craftsman and artist. By the end of the course, everyone will have achieved a solid foundation for designing and producing high-quality woodcut prints in a small space using quality tools and materials.